Shortbreads are one of my favorite cookies. Scottish in origin, this rich, tender, and crumbly straw colored biscuit (cookie) was once served only during Christmas and New Year's Eve (Hogmanay). In its most basic form, shortbreads are made with just three ingredients, butter, sugar, and flour. While today they are made in various shapes and sizes, at one time the dough was baked in a round mold and then cut into wedges that were given the name "Petticoat Tails". This name refers to the shape of the shortbread wedges which is similar to the bell-hoop petticoats worn by court ladies in the 12th century. The secret to making a good shortbread is to use a high quality butter. Butter in the States is graded according to flavor, color, texture, aroma and body and one easy way to tell the quality of the butter is by the letter code or numerical number listed on the butter's package. The highest grade is labeled AA with a 93 score. An even better choice is to use a European-style butter which has a higher butterfat content. When you buy butter you have two choices; salted and unsalted. My preference is to use unsalted butter so I can control the amount of salt in the recipe plus I like its pure sweet buttery flavor. Shortbread Cookies are delicious plain, but they are also very good when the ends of the cookies are dipped in melted chocolate. This shortbread is often called "Royal Shortbread". Shortbread Cookies: In a separate bowl, whisk the flour with the salt. In the bowl of your electric stand mixer, fitted with the paddle attachment (or with a hand mixer), beat the butter until smooth and creamy (about 1 minute). Add the sugar and beat until smooth. Add the flour mixture and beat just until incorporated. Divide the dough in half and then roll each half between two sheets of parchment or wax paper until it is about 1/4 inch (.6 cm) thick. As you roll, periodically check the top and bottom sheets of parchment and smooth out any wrinkles. Place the dough on a baking sheet (along with the parchment paper) and place in the refrigerator until firm (about 30-60 minutes). 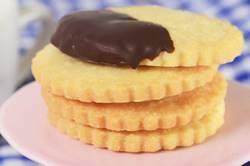 Cut the chilled shortbread into rounds or other shapes using a lightly floured 2 1/2 inch (6.5 cm) round cookie cutter. Place on a parchment lined baking sheet, spacing about 2 inches (5 cm) apart. Gather up the scraps and re-roll. Put the cookies in the refrigerator (this will firm up the dough so the cookies will maintain their shape when baked). Meanwhile preheat your oven to 350 degrees F (180 degrees C) with the rack in the center of the oven. Bake the cookies for about 15 minutes, or until the cookies are lightly browned (the longer the cookies bake the more crisp they will be). Cool on a wire rack before dipping in the melted chocolate. Chocolate Dipped Shortbreads: Place 3 ounces (90 grams) of the chocolate in a heatproof bowl and place it over a saucepan of barely simmering water. Once the chocolate has melted, remove it from the heat. Add the remaining finely chopped chocolate and stir with a heatproof spatula until the chocolate has completely melted and is smooth and glossy. Then, taking one cookie at a time, dip one end of each cookie in the melted chocolate. Place it on a parchment lined baking sheet. Once all the cookies have been dipped in the chocolate, place the baking sheets in the refrigerator for about 10 minutes, or until the chocolate has hardened. Makes about 28 - 2 1/2 inch (6.5 cm) shortbread cookies.